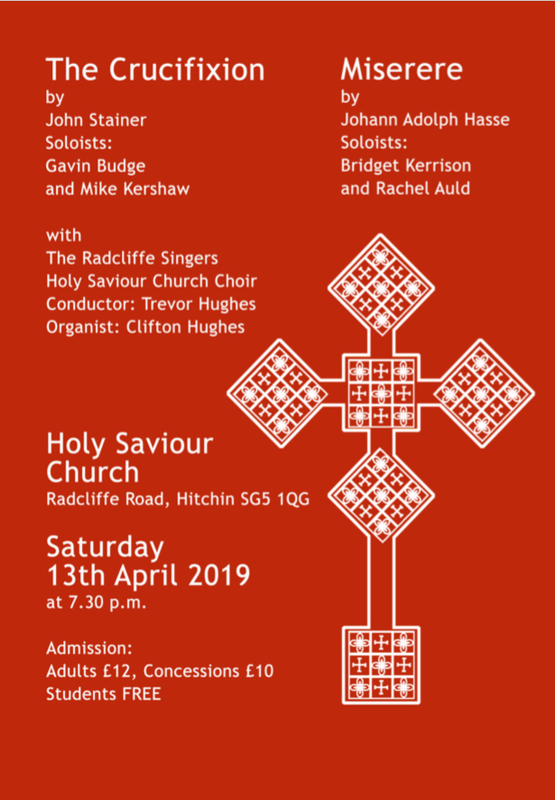 The concert will be performed by Holy Saviour Church Choir, and The Radcliffe Singers, conducted by Trevor Hughes, with soloists Bridget Kerrison, Rachel Auld, Gavin Budge, and Mike Kershaw. The organist will be Clifton Hughes. Stainer’s Crucifixion, a perennially popular work, was written in 1887, 22 years after the building of Holy Saviour Church, and dedicated to the choir of Marylebone Church. Hasse’s Miserere in C minor, a setting of Psalm 51, was written in the mid-1700s for the girls’ choir of the Scuola degl’ Incurabili, one of the four famous Conservatorios of Venice. Saturday 13th April 2019, at 7.30 p.m. Admission £12 (Adults), £10 (Concessions); Students FREE (tickets available at the door). This entry was posted in Events on 19/03/2019 by admin. Holy Saviour Church’s Annual District Church Meeting is on Wednesday 27th March at 8:00pm in the church hall. This is our chance to hear reports of church life from the past year, and help to plan for the year ahead. Do come along! This entry was posted in Events on 07/03/2019 by admin. 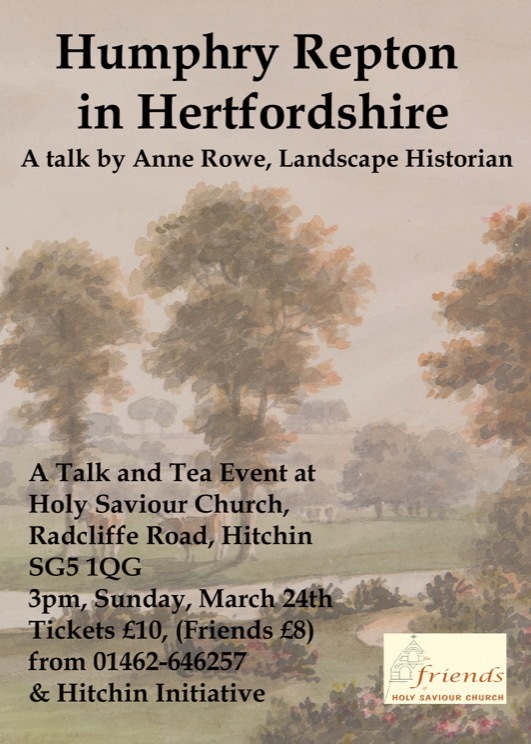 The Friends of Holy Saviour Church invite you to their next “Talk & Tea“ event, when Anne Rowe, landscape historian, will give an illustrated talk about Humphry Repton in Hertfordshire. Humphry Repton was the last great English landscape designer of the eighteenth century and is often regarded as the successor to Capability Brown. Anne Rowe’s talk, focussing on Repton’s work in our county, will be an ideal opportunity to learn more about the life and work of Britain’s first “landscape gardener”. Sunday 24th March at 3pm in Holy Saviour Church, Radcliffe Road. Tickets cost £10 (Friends £8) including tea after the talk; contact Clare Fleck (01462 646257) or visit the Hitchin Initiative Office, 1A Churchyard. This entry was posted in Events on 27/02/2019 by admin. 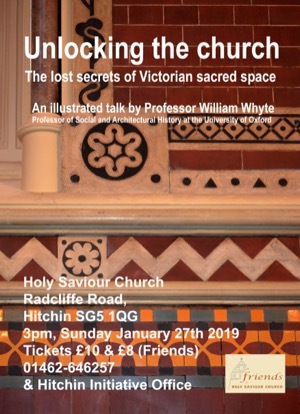 The Friends of Holy Saviour Church invite you to their next “Talk & Tea“ event, when William Whyte, Professor of Social & Architectural History, University of Oxford, will give an illustrated talk about the lost secrets of Victorian sacred space. The Victorian built thousands of churches – including Holy Saviour – and restored still more. 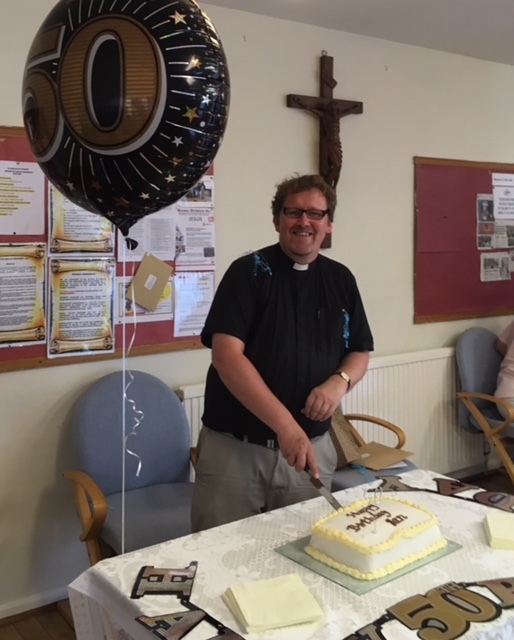 Professor Whyte’s talk will explain how and why the 19th century changed the way churches look and sound, and what they were meant to do – changes which still shape our experience of the church today. This entry was posted in Events on 02/01/2019 by admin. As usual we launch our Festival weekend with this ever popular evening event – a chance to enjoy a leisurely look at the display, before “Sing We Now of Christmas” – a concert of popular Christmas music in mellow jazz arrangements, performed by Holy Saviour Church Choir, The Radcliffe Singers, The Buccinate Brass Ensemble, with Janet Tothill (double bass), directed by Trevor Hughes. We are delighted that Pam Rhodes, popular broadcaster and author, will compère the concert. 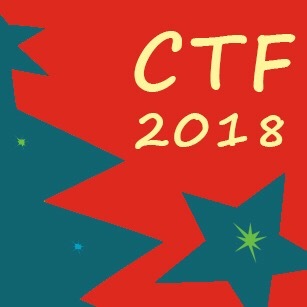 This entry was posted in Events on 22/11/2018 by admin. 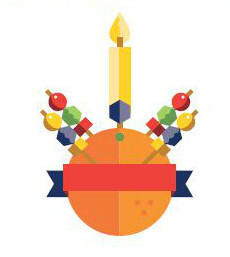 Come to the Christingle Service in aid of The Children’s Society on Sunday 6th January at 11.30am at Holy Saviour Church. This entry was posted in Events on 29/10/2018 by admin. 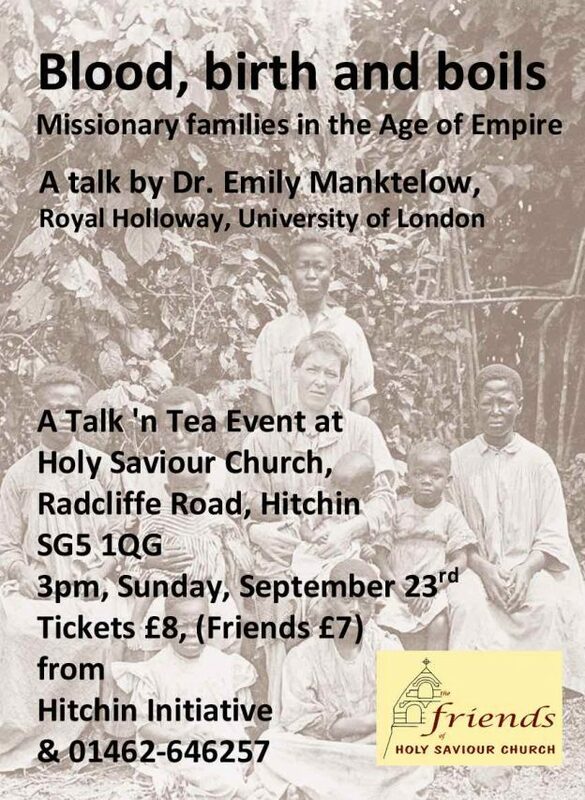 The Friends of Holy Saviour Church invite you to their next “Talk & Tea“ event, when Dr Emily Manktelow, of Royal Holloway, University of London, will talk about the realities of life for missionaries and their families in far flung outposts of the British Empire. How did starched and corseted middle class Britons cope with insects in the cot, strange men under the bed and cow dung as household polish? Come along and find out! Tickets cost £8 (Friends £7) including tea after the talk; contact Clare Fleck (01462 646257) or visit the Hitchin Initiative Office, 1A Churchyard. This entry was posted in Events on 09/09/2018 by admin. 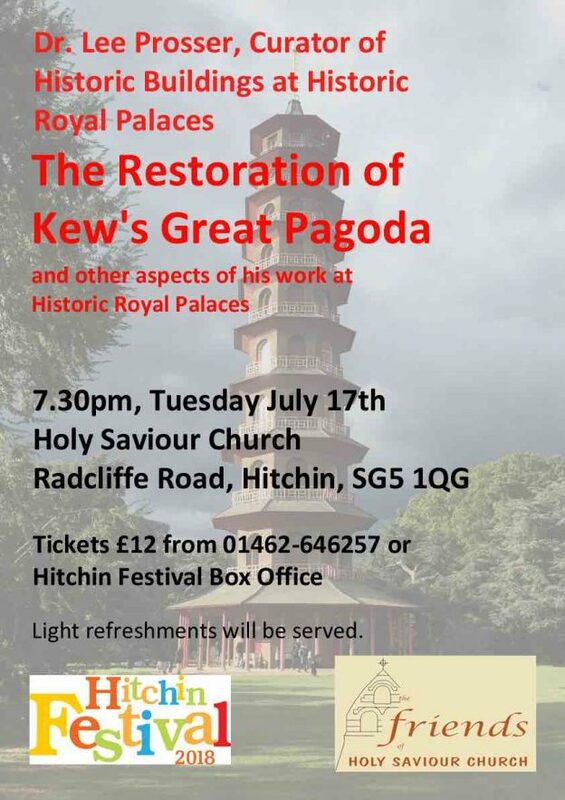 Dr Lee Prosser, Curator of Historic Buildings , Historic Royal Palaces, will talk about this recent major project, and other aspects of his work at Historic Royal Palaces. Tuesday 17 July at 7.30pm in Holy Saviour Church, Radcliffe Road, Hitchin. 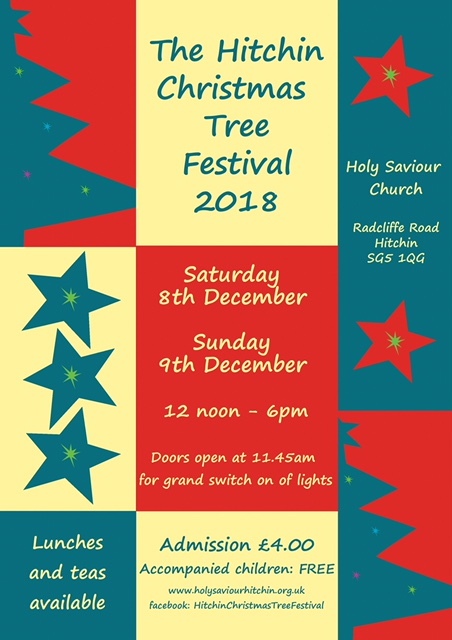 Tickets £12 (“Friends” £10), including light refreshments, are available from Clare Fleck (01462 646257) or the Hitchin Festival Box Office, 1A Churchyard, Hitchin. This entry was posted in Events on 03/07/2018 by admin.